I've been busy working that I've almost forgotten I have a blog. I have to meet my deadline this week as what I've promised to my client. Also, I was busy thinking - whether to still pursue my profession or take the other direction. I'm starting to lose hope already as years has been counted but still, there's no opportunity for me. Besides, my heart is not 100% dedicated to my profession, I feel like I wanna try other stuff. I don't wanna listen to my mom and sister bugging me anymore. I just wanna listen to myself. 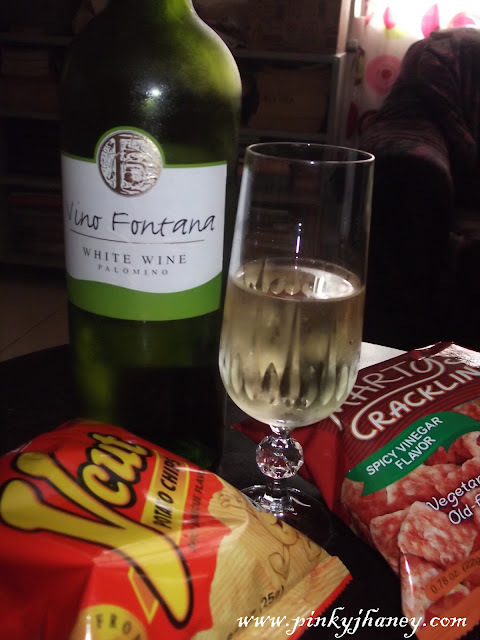 To make my post short, I drank a glass of white wine with some chips while reflecting on some stuffs about my career. Well, I'm very unpredictable and I hate myself for that. Yey, naalala mo din ang blog me. Hehe. I do that also. Well sometimes. Kalimutan ang blog and mag-relak relak muna. Hehe. Cheers sis!